The North Essex Theatre Guild, NETG, has announced their nominations for the annual Showcase Festival Awards. It will be held in September at Clacton Town Hall. Clacton Musical Theatre Society has been nominated a fantastic 9 times! 'Adjudicators' Award' for 'The Dancers and Choreography in 'Cinderella'. 'Best Supporting Actor' for Keith Goldsbrough as 'Cosmo Brown' in 'Singin' in the Rain'. 'Best Supporting Actress' for Laura Thompson as 'Dandini' in 'Cinderella'. 'Best Dame' for Keith Goldsbrough as 'Grizelda' & Keith Peck as 'Mona' in 'Cinderella'. 'Best Actor' for Ben Long as 'Buttons' in 'Cinderella' & 'Don Lockwood' in 'Singin' in the Rain'. 'Best Actress' for Danielle Nundy as 'Prince Charming' in 'Cinderella'. 'Eric Dyster Cup for Best Pantomime or Childrens Play' for David Thompson & 'Cinderella'. 'The Terry Sadler Memorial Trophy for Front of House' for 'Cinderella'. Opportunity for our Members to Appear in a Film! A opportunity has arisen for some of our Members to appear in a film. It will be filmed by the Pacitti Company, who are calling the film 'On Languard Point'. It will be filmed on Clacton pier on Wednesday 17th & Thursday 18th August 2011, all day. Times to be confirmed. They are looking for the following which the Society can provide the Costume. 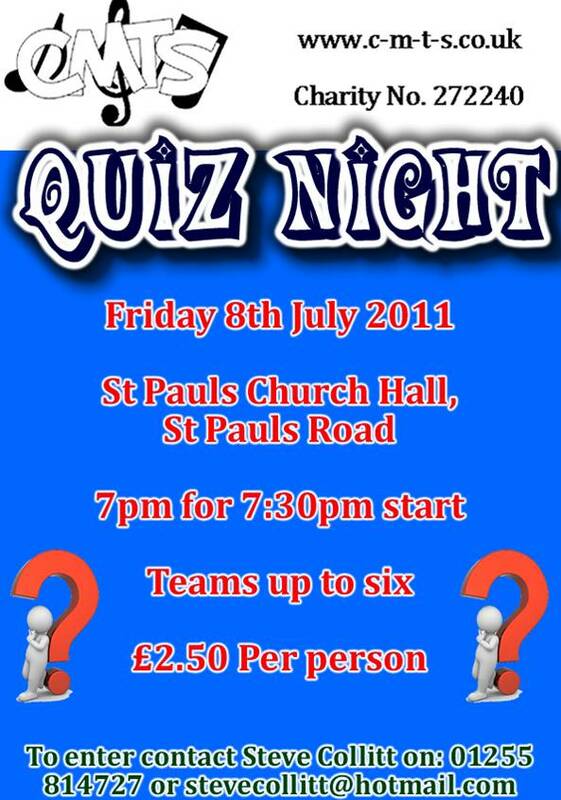 If you would like to be involved, please contact Sam McCarthy, Chairman, as soon as possible. Thanks. Open to all Members, including the 'Youth Performers' and their Families. Bring the kids for an afternoon of fun and frolics! All cast members for High Society please could you attend the Cheese and Wine Evening on 19th July for a whole cast photo. This is for the award that was won. 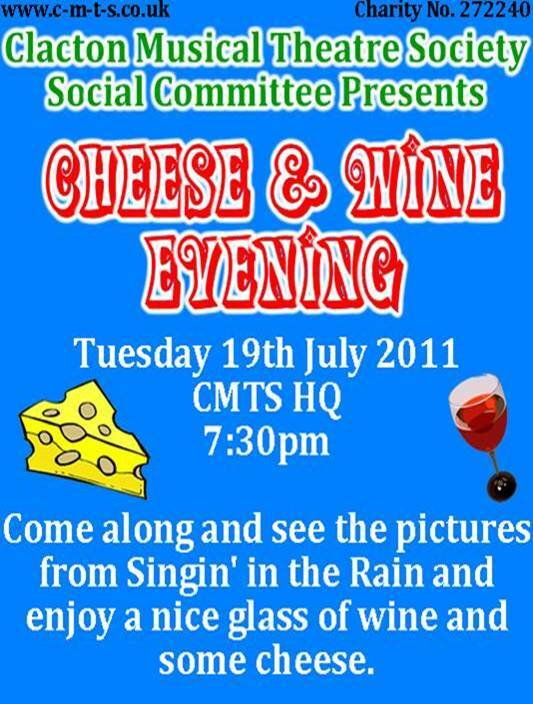 CMTS Social Committee Cheese & Wine Evening! Please contact me by Monday 18th July confirming your place. lewis1995@tiscali.co.uk or 07796791085. Thanks. 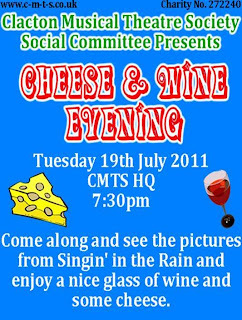 The Social Committee will be holding a Cheese and Wine evening so Members can come and view the Singin' in the Rain photos. It starts at 1930 and is being held at the CMTS HQ. All are welcome. Orders for the photo discs will be taken once paid for. We will be having a meeting on Wednesday 13th July at the CMTS HQ, starting at 1930. At this meeting we will talk through what we have volunteered to do at each Carnival event and also Member's ideas for our float, which will be for 'Pinocchio'. 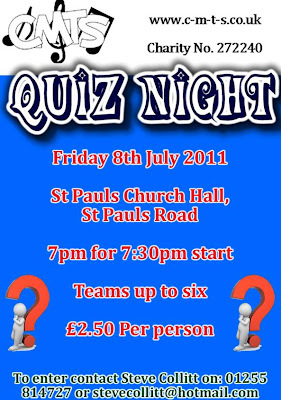 Hope to see you there but if you can not make it and would still like to be involved, please contact Sam McCarthy, Chairman. Thanks. Adult Community Learning is having an open day at the Clacton Centre on Wednesday 13th July from 2pm-8pm. There will be free tasters in French, Italian, Makaton, British Sign Language, Computing, ECDL, Drawing and Painting, Jewellery Making, Floristry, Pottery, DIY Skills, Stage Make-up, Nails and much more. The open days will also give people the chance to view learners’ work, speak to staff and pick up our exciting new course directory for 2011-2012. Call 01255 424151 or visit www.essex.gov.uk/adultlearning for more information. Over the summer months, Essex Police and Essex Police Authority will be asking your opinions, listening to your views and seeking to understand the impact that any changes to Essex Police may have. Your views are extremely important and they would be grateful if you could take time to answer the questions in our public survey. 'We very much enjoyed the show and compliment all the cast on an excellent performance that deserved a much larger audience. Please accept our best wishes to the Society and it's Members; and long may it prosper and continue to delight its audiences in the future.' Nick Lee, Vice President of the Rotary Club of Clacton on Sea. 'We thoroughly enjoyed the show and I was particular pleased to see the different ages and abilities of your Members; and that there was many faces I was familiar with, some I have enjoyed many shows performing alongside them. Congratulations on a spectacular offering' Colin Thorne, Colchester Operatic Society. 'I would like to thank you for the Saturday matinee performance, we enjoyed the afternoon immensely'. Clifford Sullivan, Clacton Camera Club. 'Well done for all the excellent work. There were some nice touches, thank you for a loverly evening'. Indi Allen, MAD Theatre. 'We would like to thank you all for a wonderful evenings entertainment, we thoroughly enjoyed the performance.' Tony Merryweather. 1st Holland on Sea Scout Group. 'A short note of appreciation for ... tonight's performance ... we very much enjoyed the performance'. Alex Stanmore. CAB Chairman. Need some help with the digital TV switchover? Digital UK are holding 4 drop-in sessions at the Community Information Centre to offer advice and answer any questions you have about the switchover. The sessions are from 10am to 4pm on Wednesday 6th July, Thursday 7th July, Wednesday 20th July and Thursday 21st July and you could be eligible to receive easy to use digital equipment, home delivery and installation etc. Ensure you come along so that you can advise you colleagues, service users, friends and family. CVS Tendring's Volunteer of the Year! Only a few days left to Nominate your Volunteer or Volunteer Group of the Year! Do you know of someone who deserves recognition for their voluntary work in the community? It may be your friend, neighbour or colleague, or it may be a group of volunteers? Why not nominate them for Volunteer or Volunteer Group of the Year – all nominees will receive a framed photograph and the winners will receive £250 to the charity of their choice! This year, CVST will be hosting the Volunteer Awards and our AGM followed by a free network buffet at our Community Information Centre on Friday 22 July at 11am. 'Singin' in the Rain' Programmes. The Management Committee are looking into obtaining some more Programmes from 'Singin' in the Rain'. We are sorry that we sold out and that some Cast and Crew did not get a copy. If you did not get one and would like a Programme still, please can you contact Sam McCarthy, 'SITR' Production Committee Chair, by Monday 11th July 2011 by either phone, text or email. Thanks. Many thanks to those Members who lent the Society an Umbrella for the window display at Clacton Factory Outlet. They are all at the CMTS HQ, to be collected when you next go up there.